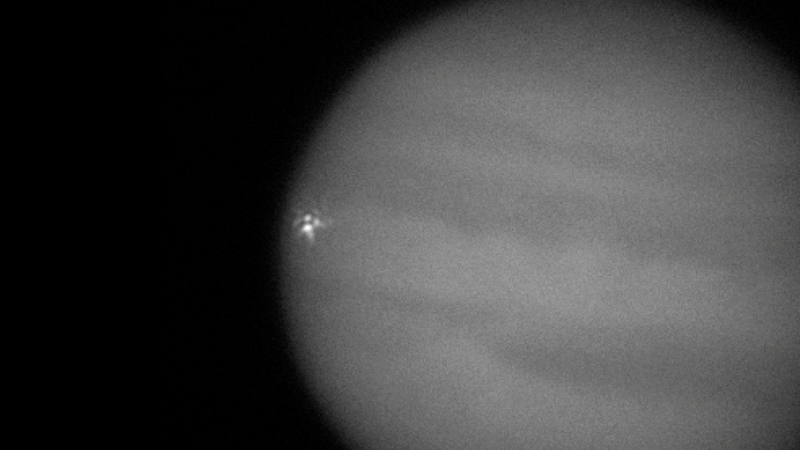 From Astronomy.com: Well, Jupiter’s done it again. The biggest planet in the solar system was the site of a bright impact early Monday morning, similar to collisions in the summers of 2010 and 2009. Scientists and observers aren’t sure exactly what hit Jupiter — most likely a stray comet or asteroid — but if the impact leaves behind a break in the planet’s cloud tops, it’ll shed some light on what kind of object created it. Jupiter in Hebrew is called Tzedek, which means ‘righteousness’. It is the largest of all the planets and is called the Star of David. It represents kingship, coronations and birth of kings. It represents the Messiah, the Coming King. In 1994 the Shoemaker Levi Comet broke into 21 pieces. For seven days, from July 16 to 22, a series of 16 fragments from the comet began to bombard the surface of Jupiter, each impact was stronger than a nuclear bombarded the planet the area affected was larger than planet earth. This happened on Av 9 (Tisha B’Av) the most dreaded day on Israel’s calendar. This was the SAME DAY- Secret talks were going on in Oslo, Norway to exchange Israel’s land for peace, “Oslo Accords”!! The beginning of the cosmic activity was the 9th of Av which is the anniversary of many disastrous events, including the destruction of Solomon’s Temple in 587 BC and Herod’s Temple in 70 AD. Again on July 21, 2009, A giant scar-like blemish has appeared in the clouds near Jupiter’s south polar region, which NASA observed in infrared after receiving a tip from an amateur sky watcher in Australia. The likely impact appears to have occurred exactly 15 years after the remnants of Comet Shoemaker-Levy 9 bombarded the planet in 1994 in an event that was widely predicted and scrutinized as it happened. The latest impact was not predicted, and it was caught by chance. June 2010 Israel was experiencing the Flotilla incidents. Pulitzer Prize-winning columnist Michael Goodwin says President Obama’s appeasement policies helped to create the Gaza flotilla incident … Weakness always begets aggression; and, like clockwork, Obama’s repeated signals that he is weakening America’s commitment to Israel are emboldening the Jewish state’s enemies. September 11, 2012 it was hit again. Riots have broken out in the Middle East, US Ambassador to Libya has been murdered, riots have also come to Jerusalem.